Fancy yourself as a golfing pro? Eat sleep, and dream golf? Want to incorporate it into all your important life events? Why not go for a golf-themed wedding, which is well catered for at venues across the country and further afield. We look at just a few of the options out there, as well as finishing touches to complete the day. Markland Wood golf club has a newly renovated club house, where they are offering catering for wedding receptions and ceremonies. Or you can have the ceremony outside, against a verdant backdrop of the rolling green golf courses and thick arrangements of trees. There are several pretty spots to choose from and centre your reception. Fort Langley has rooms that can be booked separately or in different combinations, so it can cater for weddings of all sizes, and is adjustable should you need to change plans. It is also one of the few venues not requiring a food and alcohol minimum. This versatility means you can plan your rustic or upscale wedding with minimal hassle. There are intimate spots you can pick out for saying your vows, and fireplaces and other extra features that give surprising intimacy for parties of over two hundred people. And the views from the seated patio while you dance the night away are hard to beat. If you want something less conventional, head further afield; located at La Vegas’ Rio Hotel, Kiss Monster Mini Golf got a great review, complete with wall to wall Kiss songs (funnily enough), and is one way to spend your big day if you plan a zany Vegas themed wedding. They have hours of fun with eighteen holes of mini golf culminating in a final putt up Gene Simmons’ tongue to finish the course. And what about the finishing touches? 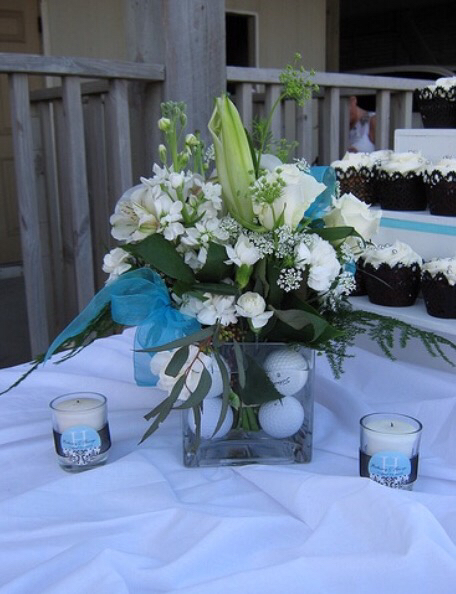 Personalized golf ball wedding favours are a good place to start. Instead of a huge cake, opt for individual golf themed cupcakes with icing flags, lawn and tiny golf balls. Anything from the golf ball cuff links n the groom, to the ‘iced tee’ and ‘bucket of balls’ in the buffet arrangements will complete the picture. You could even start the celebrations off, arriving at the spot to exchange vows in your own cool buggy.